With a name like HoneyVape, you know these vapes are going to be sweet! HoneyVape oils are known for their incredibly delicious smells and flavors. The thick oil burns smooth, producing fat vape clouds similar to the smoke from a hookah – such a delight! These high potency (70%+ THC) cannabis oils come in pre-filled vape cartridges filled with coagulated oil, quite thicker than most vape oils. The cannabis oil in these cartridges are a gorgeous, crystal-clear yellow that burns smoothly and forms full, dense vapor clouds. The weighted cartridge feels solid and of high quality with its glass container and metal mouthpiece tip. 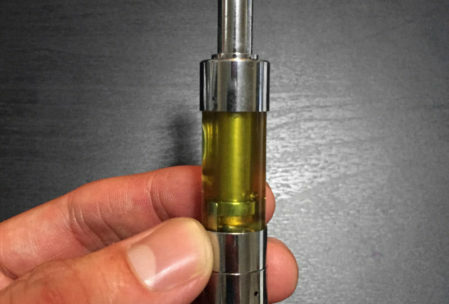 Because HoneyVape oils are so thick, they may require pre-heating the cartridge (blow dry or run under hot water for a minute or so) before taking hits. You can also give the new cartridge a few dry hits to coat the internal wick with oil, before attaching to your battery/vape pen. 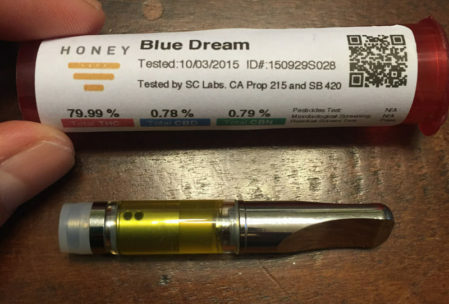 With the small, 0.5 g cartridges (150 dose), we occasionally hear complaints about defective HoneyVape cartridges that aren’t able to draw smoke fully. The manufacturer recommends poking around inside the hole at the bottom of the cartridge (hole in the atomizer, not the mouthpiece) with a paper clip. This usually does the trick! These vapes do not come in universal 510 threading. Most beginner level vape pens will require an adapter to fit the larger threading of these vapes. Vape adapters are available through Greenly. 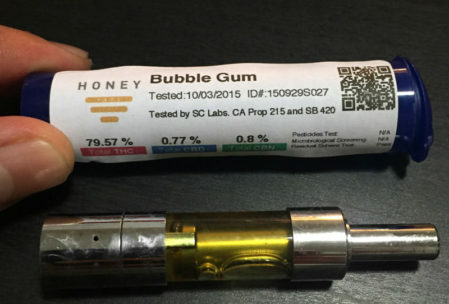 Honey Vape products are available in California. Check with delivery marketplaces and like Eaze and Nugg to see if Honey Vape products are available for delivery in your area.